In this simple to understand video turning Pro will take you through all the steps to install a fully automated irrigation system in your yard. This a residential irrigation system specifically designed for anyone to install even if you’ve never attempted such a project. You will learn how to install a pop-up sprinkler system for lawns, how to tie into your water service, install a backflow preventer and irrigation controller, layout sprinkler heads, dig trenches for piping and install valves. We will demystify irrigation equipment and products and show you how to select the right type of equipment for your system. You will also learn how to select the right pipe size, determine sprinkler head spacing and sprinkler zones. All steps you will see are tried and true installation techniques perfected by highly experienced landscape professionals over the course of many years. Each step is fully described and illustrated. From the planning stage to buying materials to testing the system, you will gain the confidence and skill necessary to install your own irrigation system. Turning Pro will demonstrate the advantages and time savings of installing an automatic irrigation system over manual watering. 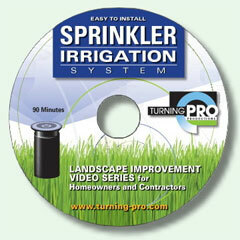 Install a pop-up sprinkler system for lawns. Connect to your water line. Dig trenches and install piping.